When is comes to Erika, the Celadon City Gym Leader, her team has only changed sightly. Instead on having just her Tangela (Level 33), Weepinbell (Level 33) and Vileplume (Level 34) originally, she now has a team of five Pokemon with levels greater than fifty. 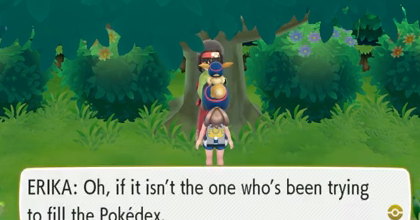 To be exact, all of her Pokemon this time around will be at Level 56, with the exception of her Vileplume that will be at Level 57. If you put this into perspective, you will quickly realize these are similar numbers to the Pokemon your Rival had during your Championship Match! In all, Erika will battle with Tangela, Parasect, Victreebel, Exeggutor and Vileplume this time around. Just like your first match against her, Erika's Pokemon Team will continue to be very weak to both Flying Type Pokemon and Fire Type Pokemon. Both of these types of Pokemon will cause serious damage to her Pokemon, and they won't take much damage from their Grass Type Attacks as well. Either of these types of Pokemon should do for this battle, preferably at Level 55 or greater in order to match up well.